The SRX712M was designed with one goal - build the lightest, smallest, loudest, clearest stage monitor possible while delivireing a strikingly professional appearance. The SRX712M uses a 12" Differential Drive® woofer and a 3" (voice coil diameter) compression driver that handles 800 watts (continuous) power in a 12" high profile. A 90° x 50° horn provides smooth, even coverage regardless of the position of the performer. 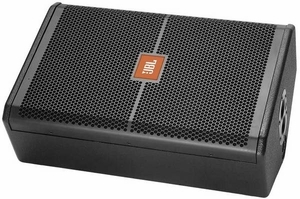 For utility speaker applications, the SRX712M can be tripod mounted or over a subwoofer with JBL's dual angle pole mount providing 90° vertical or 10° down tilt for optimum audience coverage.